This week is colored by an influential band 60 years in the making, artists’ take on a children’s activity, and the musings of a fictional blonde lawyer. In the 1950s, The Four Freshmen served as a bridge between vocal based groups and rock and roll bands of the 60s. Influenced by barber shop quartets, harmony experimentation is a key element of their music. The Four Freshmen are a source of inspiration for acts such as The Beach Boys, The Manhattan Transfer, and others. Fifty album releases, seventy top selling singles, and six Grammy nominations are just a few of the group’s accomplishments in its 60 year history. 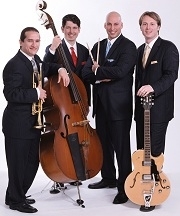 The band continues to tour, and the current line-up maintains the jazz and swing sound of the original members. The Four Freshmen come to The Sooner Theatre in Norman on Friday. Many people do not consider chalk among the highest of artistic mediums, but every year around this time in Chickasha artists take chalking very seriously. The University of Science and Arts of Oklahoma hosts the annual Montmartre Sidewalk Chalk Art Festival on April 5th from 8:00 a.m. to noon. Artists from children to adults fill the oval in the middle of the USAO campus with chalk creations in 6 by 6 foot ground canvases. The event is named after the Montmartre district in Paris known for its sidewalk art. Participants compete for bragging rights and prizes. The festival also includes vendors, food, and live music throughout the day. Beloved “blonde” lawyer Elle Woods takes the stage in Guthrie beginning April 6th. “Legally Blonde: The Musical” is an adaptation of the 2001 film starring Reese Witherspoon and the novel by Amanda Brown of the same name. The musical rendition premiered in Broadway in 2006, and the show and members of the cast were nominated for Tony Awards. The Pollard Theatre brings the story of the law school underdog to life with performances through May 5th. Other artistic festivals and musical performances take place across the state. Musician John Paul Keith performs at VZD’s in Oklahoma City on April 6th. Keith combines a wide variety of music from rockabilly to garage rock with jazz and blues to create a unique Southern sound. The seventh annual Scissortail Creative Writing Festival hosts award-winning authors and features over 50 writer presentations April 5th through the 7th at East Central University in Ada. The Chancel Choir of Central Presbyterian Church in Oklahoma City performs “Requiem” by Bradley Ellingboe on Friday, April 6th in celebration of Good Friday and the Easter weekend. “Requiem,” performed by a choir and instrumental sextet, uses English poetry and scripture with Latin Requiem text. For more information and events, visit the calendar page of our site.